We can always associate a bride to reflect a royal and queenly persona as she walks down the aisle. And for that matter, an amazing and elaborate hairdo always adds beauty and power to a bride’s appearance. Well, it’s time to adorn your hair majestically with eminent and distinguished ethnic jewellery. The mesmerising jewels and chunky pieces surely won’t go unnoticed during your celebrations. The royal, subtle and exuberating styles can add up to a royal courtesan look. So if you too want to add that exotic and imperial vibe to your look, the options are endless. 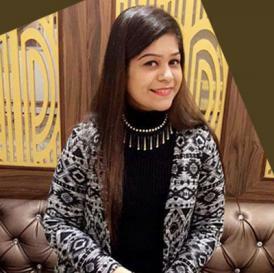 Ranging from big stones, to pearl strands, necklaces, maang teekas or tassels; the splendid accessories will make you fit to feel and appear like a queen. It’s time to take the ‘begum’ look up a notch with an interesting headpiece known as Jada Billalu. The round bangle-shaped accessories are an evergreen classic and famous among South Indian women. They use the chunky adornments to accessorise their long pleats. You too can add these traditional and stylish round trinkets to your must-have list of hair accessories. Gorgeous and musical ghungroos always make an impression and take your style goals higher. Mounted on your hair bun or choti; the little pearly trinkets will look jazzy and fashionable. Gear up and nail the look of a royal diva with these irresistible pieces. Let the playful pieces peep out of your net odhnis and make some noise while you walk down the aisle. Now you don’t have to go out of your way to present an imperial persona on your big-day. Just dig out your bold and beautiful neckpiece and transform it into your elegant hair ornament. The fun-filled and smart innovation will surely get you that beautiful, charming and unkempt look. From simple chain to large chokers or elegant pearl strands; you can have plenty of stylish options. Secure your amazing hairdo with pins and clips. If you aren't shying away from getting experimental, add a touch of royalty to your hairdo with an appealing brooch. Until now you have been using brooches to accessorise your outfits. But now it will make a statement for your hairdo. Pin it up to add some drama and life to your lovely locks. So, flatter your bridal locks with a brooch that is attractive as well as high on comfort. The one-piece accessory will add glitz to your fancy up do. 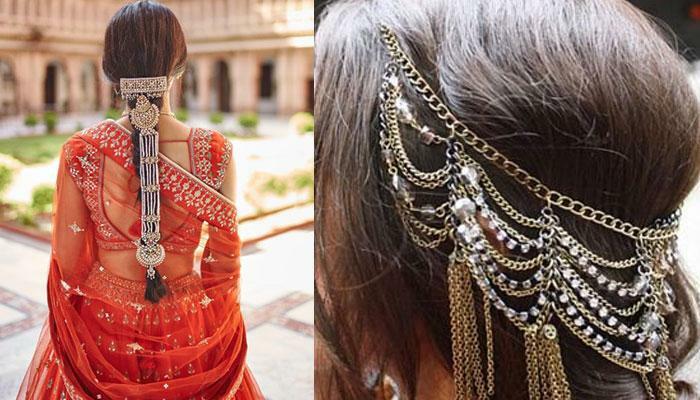 For hair jewellery with a little charisma and royalty, look no further than maang teeka and passa. These eye-catching trinkets are by far the best hair accessories for any bride-to-be. This time use the traditional jewels with a twist. The intricate pieces that usually hang in the centre of the forehead can be added to a high bun, pleats or even chotis. You will surely turn heads with your style statement and creativity. A traditional outfit without a latkan is oh-so-boring and plain. So, here comes the coolest thing to make that hairdo a little more exciting. Also, latkans are something girls can’t do without. The pretty hangings on your hair will add instant oomph and appeal to your look. From stones to kundans, mesh and ghungroos; latkans of all kinds are available in the market. Just go for the unique shapes and sizes. Spruce up the way you have been carrying yourself. Use the most in-vogue and fashionable thing to compliment your personality. We are talking about the tempting tassels that can always add a zing to your personality and will surely add justice to your glam hairdo. Ranging from gota to fabric and flowers, the season’s staple accessory is available in myriad shapes and varieties. Stunning and cute to look at, pom-poms are surely ruling the roost. Anything made of pom-pom balls looks exquisite and cute. The round-shaped accessories can give a spectacular twist to your luscious locks too. You can experiment with the cute, fluffy and charming bunch of pom-poms to rock that bridal hairdo. Yes, you heard it right. There is no thumb rule when it comes to styling yourself. You can be tricky and clever enough to use your earrings for a different purpose. So, no need to part with your old earrings. Just opt for heavy stone or kundan earrings and look like a real-life queen. Here are the ethnic and exquisite hair accessories that can make you look more than just beautiful on your special day. Customise your jewels and ornaments to have that royal diva look. So, this season don’t style your hair in a usual way. Try to recreate a princess avatar with an array of traditional jewellery and ornaments.